These four poems (classic and modern) on the same theme provide plenty of opportunities for comparing and contrasting different poetic forms, rhythms and moods. 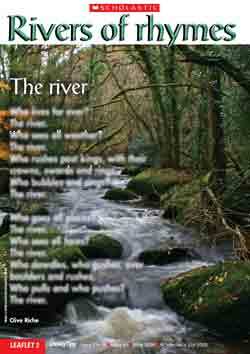 They include a kenning and shape poem, a chant and a conversation poem. These teachers’ notes accompany the guided reading leaflet from Literacy Time PLUS Ages 7 to 9, May 2009. DOWNLOAD THE LEAFLET HERE . Give out copies of the activity sheet below and explain that you are going to compare four different poems about rivers. Suggest that the children make notes on the chart as you discuss the poems. What effects are the poets trying to achieve with the poems’ shapes? I’v got my own river, It has lots of rocks, It makes me want to quiver, But it has lots of locks. I love my river, I love to lay beside it, Even though it makes me quiver, There is also a sand pit.